The Women's Premier Soccer League (WPSL) is an independent highly competitive national league whose main focus is on the development of highly competitive premier women's soccer teams. The league has over 100 clubs participating from all over the United States. The WPSL also makes every effort to bring quality soccer to all levels of the community and to promote the stature of female athletes as role models for our youth. Through the years, our league has had many national open and amateur cup victories. The WPSL was formed in 1998. It is sanctioned by the United States Adult Soccer Association (USASA), who is an affiliate of the United States Soccer Federation (USSF), the ruling body of soccer in the United States and FIFA the world's ruling body for soccer. The WPSL season runs from May 1st to August 1st. There is a league championship tournament that is held the last weekend of July in venues that vary from year-to-year. Teams can expect to play 10-16 games during the season. Cesena USA is now prepared to participate in an exciting, expanding league whose focus is strictly upon the development and promotion of women's soccer players from around the world. We are proud to now be part of the “foundation” of committed and prestigious teams located throughout the nation. Players are selected for the Cesena USA WPSL roster utilizing a series of professionally managed and run "Identification Sessions" and open/rolling tryouts leading up to the start of the 2019 playing season. Our international staff strives to identify highly skilled local players that exhibit technical ability, conceptual knowledge and demonstrate leadership abilities on the field of play. The selection process for the Cesena USA summer 2019 WPSL season begins months ahead of time with a series of Identification Sessions over the preceding winter. Players are selected at the discretion of Cesena USA Technical Director and coaching staff. The objective is to have teams completed by Late April 2019 with "fill-in" tryouts held in early May for complete rosters for summer season play. Once Cesena USA players are selected they will participate in team training sessions and scrimmages versus clubs throughout the area to sharpen players skills and conceptual knowledge. All players interested in participating at our tryout sessions MUST register by clicking here. Cesena USA WPSL "Primavera" To Hold Tryouts For 2018-19 season! As local clubs begin to plan on many of their girls to play with their respective high schools in the spring, Cesena USA we will be moving forward with the creation of our WPSL “Primavera” 99G team. This group will play US Club and consist of a mix of ‘99/’00/’01 players and will form the backbone of our WPSL program. This US Club rostered team will be the WPSL “Primavera” Team (WPSL Reserve Team) as we look ahead to 2019 and the WPSL regular season. This group will play winter and early-spring tournaments with our 1st Tournament on February 17th-18th. Once players make the cut, they will be included throughout the summer 2019 WPSL season to supplement our 1st team roster if needed. Please contact Andy Vera at andy@olddominionfc.org for more information! WPSL Cesena USA Latest NEWS! 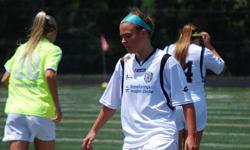 ODFC Cesena Transfers WPSL Player To Italy! ODFC Cesena USA is proud to announce that an official transfer offer has been made to Becca Deegan (WPSL 1st Team) from Jesina Calcio Femminile in Italy’s Serie “B” professional league. The club Jesina is based out of Jesi, Italy a town in the province of Ancona in the Marche region. Becca joined us this current season from Delta State University where she was team captain for all 4 years. She represented the England Under-17 and played at the highest premier level of soccer with Everton Ladies. Andy Vera, ODFC Cesena USA GM had this to say, “Becca has been presented with a tremendous opportunity, her ability and strong personality will serve her well in the Italian league. She is the 1st from Cesena USA given this honor but she won’t be the last…she has earned this opportunity and we wish her nothing but the best." Becca is due in Italy by mid-August for the start pre-season training. Italian National Team Women To Join Cesena USA! ODFC Cesena USA has sent our Italian contacts a "letter of intent" to bring two Italian Nationals, Amanda Tampieri and Sara Quadrelli to the USA for the 2017 WPSL season. Amanda is a ’97 class star goal-keeper from, Ravenna, Emilia-Romagna currently playing Serie "A" with USD San Zaccaria. Ms. Tampieri was also an integral part of the Women’s Italian National U-19 Team 2014-15. Sara Quadrelli is a "defender" from, Rimini, also in the Emilia Romagna region of Italy. Sara is a '97 class player currently playing Serie "A" in USD San Zaccaria and a member of the Italian National Team U-23 squad. ODFC Cesena is currently working with the United States Soccer Federation (USSF) to arrange proper transfer and processing of these players in time for the WPSL Cesena USA home opener on Saturday, May 20th.